The locality lies east of Al-Khan Al-Ahmar, close to the entrance of the Mitzpe Yericho settlement, along both sides of Road No. 1. In order to travel from one cluster to another, residents make use of a drainage channel that crosses beneath the main road, or endanger their lives by crossing the highway. The community originated in the Tel Arad area, and moved from there in the 1940s to the Hebron area, continuing in the early 1960s to the Um Rassas area, where Ma’ale Adumim is now situated. In 1980, the residents were evacuated from the area, which was intended for the establishment of the settlement. Some moved to the Beit Hanina vicinity, and some moved to the area where Mitzpe Yericho is now located, due to proximity to the E’in Fara spring, and since they had used the area in the past for winter grazing. In 1981 and 1982, they were again evacuated, this time for the establishment of Mitzpe Yericho, and they took up residence nearby and were again evacuated some two years later, in 1983, to their present location. This new location was assumed in conjunction with the Civil Administration, which promised that it would be their permanent place of residence. Today, residents are again facing the threat of yet another forced removal. The lands occupied by the community belong to Nabi Musa, and all of them were expropriated in the massive expropriation of 1975 as part of the plans to establish Ma’ale Adumim. The community lies within the jurisdictional area and master plan of Ma’ale Adumim, and partially within the master plan limits of Road No. 1. All of the buildings there are under demolition order, delayed meanwhile by court order, but the Civil Administration is conducting ongoing negotiations with residents in an attempt to convince them to move to the Steiha and Nue’meh area, a solution that is unacceptable to them. Some of the residents purchased private lands in 2005 in the area of Nue’meh, with the intention of building on them, but these lands were expropriated by the Palestinian Authority for the establishment of a military college. 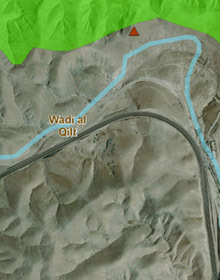 In the past, residents used a well to which they had access, near the Good Samaritan site, as well as the waters of Wadi Qilt and the E’in Fara springs, but all of these sources have been blocked and the residents no longer have access to them. The grazing areas they had previously used were also substantially reduced, and therefore, they sold most of the flocks formerly in their possession. Their reduced flock holdings serve only for domestic needs. In addition, residents are prohibited from cultivating agricultural lands in the locality, and the bulk of their livelihood derives from the peddling of souvenirs to tourists in the area, with a small portion earned from agricultural labor in Jericho. Very few community members work in the nearby settlements, and the women contribute no portion of the family earnings. The few children who attend school – six in the elementary school and two in the high school – arrive via transport provided by the Palestinian Authority. 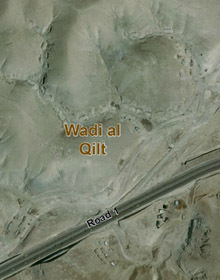 Almost no public transportation stops near the locality due to the prohibition against stopping on the main road, and access is difficult, becoming impossible at night when the metal gate leading to the Wadi Qilt tourist site is closed until morning. Sewage pipes from the local settlements pass alongside the locality to the new sewage treatment plant near the Nabi Musa Junction. On many occasions, there are malfunctions and leaks in the pipes, leading to foul odors, pollution and mosquitoes.